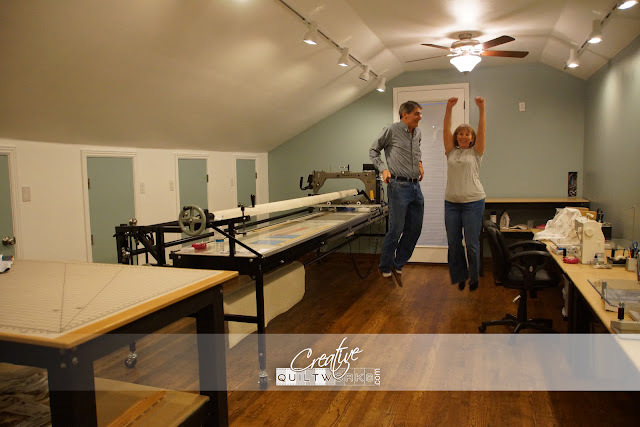 Lorri @ Creative Quiltworks: CELEBRATE the new studio is finished! This is Steven and I jumping for joy in my new quilting studio. We spent most of last year creating this space over our garage so that Creative Quiltworks could have a comfortable home. Frankly, Creative Quiltworks and I had outgrown my little laundry room sewing area that had served me since my children were little..... I am so happy to have my new quilting space! Someday, I'll show you inside all those doors--they are little closets! Congratulations! I know how much hard work you guys put in to finish this studio, you make remodeling look fun!